Find a Las Vegas Golf Club that fulfills that great picture of the perfect golf game that you have envisioned or did you mean find a Great Golf Club to swing?...ha. How about something more challenging, or perhaps a shorter course with a cocktail golf cart that cruises around? Ok, now we may be pushing it, but you know if you look hard enough, anything you need is out there. Waterfalls, lakes, views, homes and best of all the social atmosphere of clubs and practically all of them host very nice pro shops to fulfill your need for a new nine iron. Country Club or a golf social type of club? Well, we are doing our best to direct you to both. Las Vegas Country Club - Founded in 1967 it is an "oldie but a goodie", this beauty has undergone a $5,400,000 million dollar renovation. LVCC hosts a historic country club for members. There is an 18 hole course, 6 tennis courts, swimming pools, lounges barbers and so much more. You can also buy renovated condos within the community, live in a high rise, build a custom home and you would be located in right in Central Las Vegas. Red Rock Country Club - Gorgeous Red Rock Mountain views, incredible club located on the Central West Side of Las Vegas featuringArnold Palmers Signature Arroyo Golf Club course. 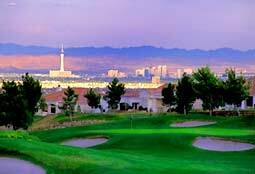 Stallion Mountain Country Club - Central east Las Vegas with a more affordable experience. Los Prados Golf and Country Club - located in North Western Las Vegas, affordable and beautiful. Spanish Trail Country Club - 3 Courses! A Robert Trent Jones Jr. Masterpiece. Golf pro shop and driving range. Located in South West Las Vegas. Tuscany Golf Club - Located in Henderson Nevada, award winning! Lake Las Vegas - Jack Nicklaus designed course at Southshore golf club. Desert Pines Golf Club - a piece of history in this incredible northeast golf course. Pro shop too! Las Vegas National Golf Club - History at it's very best, located in the "old, great" part of town, with a pro shop and restaurant, make it a great day! By the time you read this, there is probably a new and exciting Las Vegas Golf Club that has popped up! But don't dismay, From Champagne to Beer Budget, your choice is here. Las Vegas Golf contribute to our golf blog, book tee times, learn some great golf facts or take some lessons. Return to Las Vegas Golf from "Las Vegas Golf Club"